I, for one, is immensely grateful for the change Firefox has brought to the web, with openness and standards usage that has really spurred a better web climate. We all owe a lot to the people who allowed to open-source it and Mozilla for having fought that battle. The median Firefox market share value is 26% according to Wikipedia, and behind it are Safari, Google Chrome and Opera that are also all very competent web browsers. And, sure, at times Firefox is still a memory hog, but lots of fantastic work is constantly being done on improving it, and I know that virtually everything I mentioned in Help Making Firefox Better – Share Your Thoughts! is being worked on as we speak. 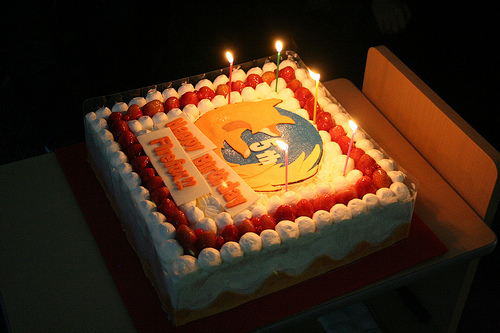 And it feels special that the birthday of Firefox is also the day of when the Berlin Wall came down 20 years ago, and they are both parts of shaping a more open world. So, congratulations Firefox, and thank you you for all you have accomplished! Here’s to another five years of improving the web! I have to admit that I'd find it hard to live without the Firefox plugins – they've definately changed the way I operate and what I expect of a web browser. But… most of all… I respect the large kick in the balls that Firefox has given to our nemesis browser over the years. Those percentage figures almost trivialise the actual numbers, too.